In the 19th Century an Anglo-Saxon cemetry, Chessell Down on the Isle of Wight was excavated, and yielded a number of interesting artefacts. Most fascinating amongst them, arguably, a decorative silver fitting from an ornate sword-sheath, continues to mystify scholars today. The item in question; a decorated silver-gilt scabbard throat fitting, was recovered from Grave 76 and has been dated to the late 5th to early 6th Century CE. A sword would have been a warrior’s most prized possession and the precious blade would always have been protected from the elements by a sword-sheath. Many such scabbards had the mouth reinforced by a decorative locket. The upper section of the Ðrote is decorated with a ladder-like band surrounded by stamped zig-zag triangles enhanced with niello *. Below this is an open-work section with two bearded helmeted heads at either end. Interlaced loops represent their bodies with hands and upraised thumbs to either side of a central 'eye' below an angular surround. The back was repaired at some point with silver strips onto which a set of runes were scratched. This repair and inscription may have been done only shortly before the sword assembly was consigned to the ground. 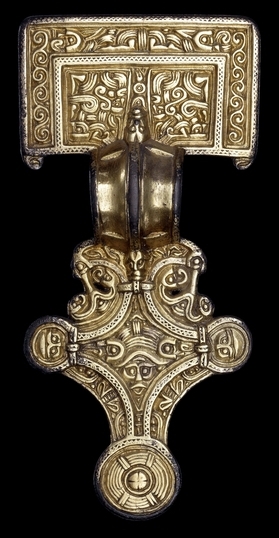 Specific features, such as the niello inlay, the openwork design and the Salin Style I heads, are also found on the earliest square-headed brooches; an example of which was found in grave 22 at Chessell Down. Scratched into the back of the throat-locket is a brief runic inscription. These faint marks were only discovered, when the piece was taken back to the British Museum for conservation. These are in the Anglo-Saxon Fuþorc-style and probably date to the middle of the 6th Century CE. The inscription clearly shows seven runic characters divided into two distinct groups. The first rune is Æsc, the third Os, the fifth Eðel, the sixth Rad and the seventh is Is. The identification of the second and fourth is more problematic. The second rune looks like an inverted modern Y. Most scholars think that it represents a local (Kentish) variant of the Cen rune. I think this is reasonable. The fourth rune is the problem. It has a single clear vertical cut and an unusual curving upper oblique one. There have been a number of attempts to make sense of this inscription with, varying degrees of success. The most popular, as put forward by R.W.V.Elliott is that the unidentified symbol is an 's'. 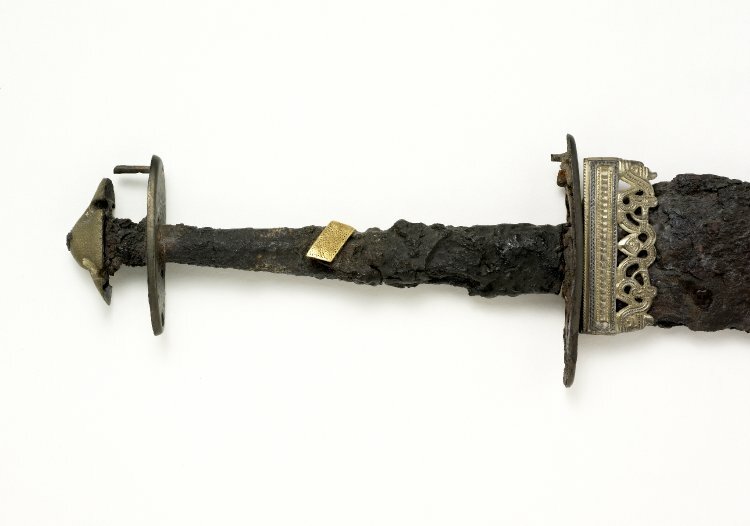 This makes the inscription read ÆCO.SŒRI – meaning 'Increase Pain' – a laudable objective for a sword. This is based on taking æco as a Kentish variant of West Saxon eaca – increase and sœri as the Kentish form of the dative-instrumental of sorg – meaning sorrow / pain. I must say that I remain unconvinced that the unidentified rune is an 'S'. I have to agree with George Hempl that it looks much more like a wynn (w) rune left open at the top. This would make the inscription read ÆCO.WŒRI – which Hempl translated as 'For self-defense'. I am not convinced by this translation, however. It relys on taking æco as an early form of æce – 'one's own' and wœri as meaning defense, although this looks more like wishful thinking than good linguistics. This would lead to a much more plausible reading of the inscription : ÆCO.CŒRI but the meaning still remains illusive.